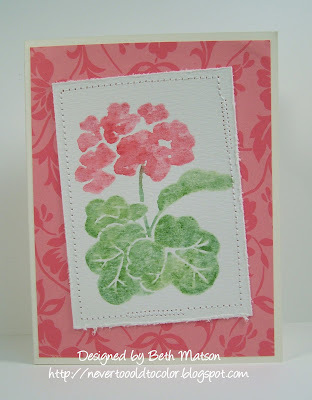 While checking out the garage sales last weekend I spotted a Geranium stamp for 50 cents. Yes, I brought it home with me. I colored the stamp with my Watercolor Wonder Crayons, spritzed it with water and stamped it on watercolor paper. After distressing the edges of the image panel I sewed it to the designer paper mat. Just a nice simple card to showcase the beautiful flower. ahhhh thanks for the sweet comment about our chich chat video!!! So nice of you!! We love doing them and we have such a blast!!! Thanks again have a blessed weekend!! Such a pretty card - simply beautiful! Love that image and what you did with it. Beautiful!